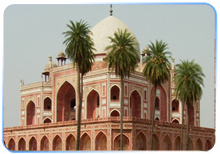 New Delhi, the capital city of India offers multitude of captivating places and premier tourists' attractions. On one side where the Old Delhi is replete with awesome mosques, quaint forts, and other time-tested historic monuments, the enchanting metropolis, New Delhi with its open spaces and fascinating government buildings, bustling business hubs depicts story of modern day India. New Delhi is not just a city; it's a book to be read which summarizes the past, present and future of India. You can be a part of this lively city and can explore the diversity of this picturesque city in your own way with Green Chili Holidays half day New Delhi tour. It is the official residence of the President of India. The RashtrapatiBhawan stands out as an architectural marvel that overlooks the lush green lawns around India Gate. 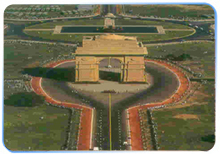 It has a magnificent view of the Rajpath and symmetrical North and South block government offices. India Gate was designed by Sir Edwin Lutyens. Originally known as All India War Memorial, it commemorates the 90,000 soldiers of the British Indian Army who lost their lives during World War I. Burning in a shrine under the arch of India Gate since 1971 is the Amar JawanJyoti or the eternal flame which symbolizes the sacrifice of brave Indian soldiers. Inspired by the Minaret of Jam in Afghanistan and wishing to surpass it, QutbuddinAibak, commenced construction of the QutubMinar in 1193, but could only complete its base. Later, his successors, added other stories. The development of various architectural styles from Aibak to Tughluq is quite evident in the minaret. 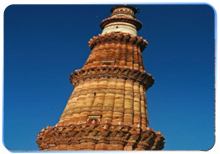 Numerous inscriptions in Arabic and Nagari characters in different places of the Minar reveal the history of Qutub. QutubMinar, the lofty tower is a heritage site which showcases the rich Mughal or Mogul past of India. The minaret is 234 feet high making it one of the highest individual towers in the world. Inspired by the Minaret of Jam in Afghanistan and wishing to surpass it, QutbuddinAibak, commenced construction of the QutubMinar in 1193, but could only complete its base. Later, his successors, added other stories. The development of various architectural styles from Aibak to Tughluq is quite evident in the minaret. The minaret is 234 feet high making it one of the highest individual towers in the world.